Friday Book Club - and 4 Days to Go!! 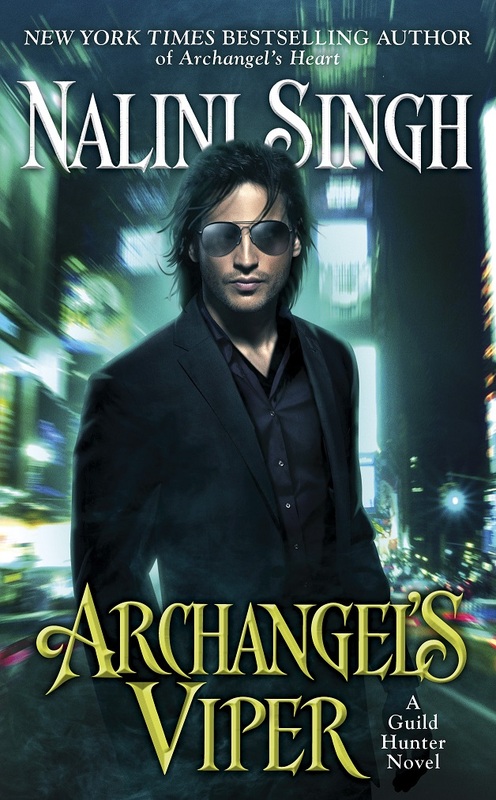 Interview at Romance Novel News - I snuck in some new information about Archangel's Legion, so check it out if you're a Guild Hunter fan. 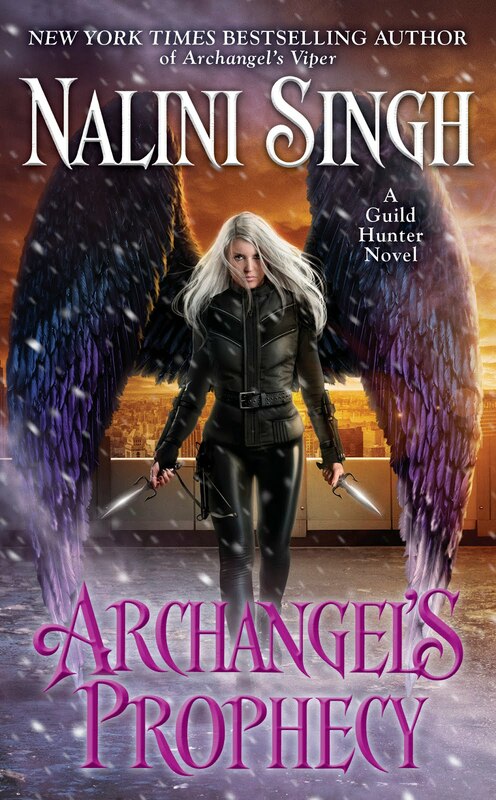 Also, GirlyGirlBookReviews discusses the Psy-Changeling series as part of the Mega Contest (don't forget, there are lots of ways you can enter, including by doing a review of Heart of Obsidian after it releases). Now, only the book club!! What are you reading and loving this week? Heart of Obsidian - 5 Days to Go!! I want to link to a gorgeous piece of fan art, done by reader Esra. It's a beautiful alternative version of the Heart of Obsidian cover. Do check it out! Also, I have another interview up, this time at The Reading Cafe. And, blogger My BookMine has put up a review of Slave to Sensation, the book that introduced her to the Psy-Changeling world. I hope you're all having a great week as we count down to the release! 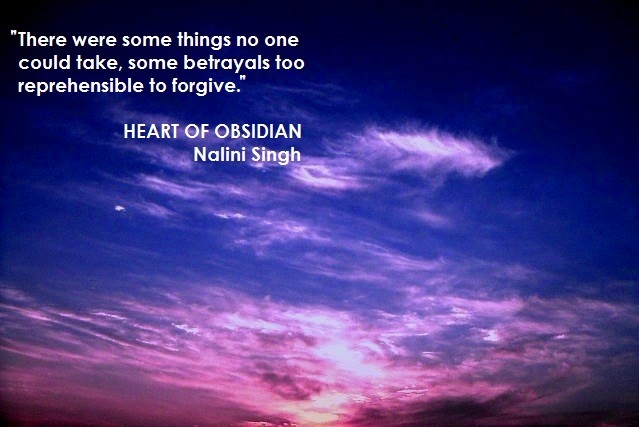 Heart of Obsidian - 6 Days to Go!! 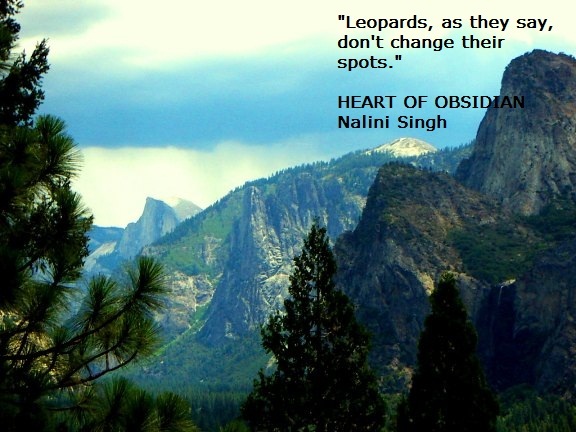 Less than a week to go before Heart of Obsidian releases! For those of you who missed the Ghost Twitter chat, reader Roxanna has done a Q&A version of it on the unofficial fan forum for easy reading. Heart of Obsidian Countdown - 7 Days to Go!! 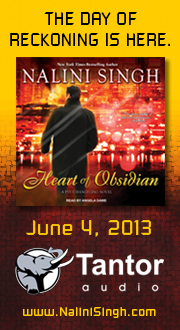 It's only a week till the release of Heart of Obsidian and my first USA/London book tour event! Syaffolee's long post about "The Ghost in the Net" where she discusses her theories of who the Ghost might be. As you know, the Ghost hijacked my profile for an hour yesterday on Twitter. There were some interesting answers to reader questions. If you missed the chat, but would like to catch up on what the Ghost said, you can read the thread on Storify. If you'd just like a summary, BookThingo tweeted that they've posted a summary on their blog. If you've posted a summary on your own blog or know of someone who has, please feel free to leave a link in the comments. p.s. Ghost Twitter chat transcript should be available tomorrow. Will link to it soon as I have it. If you don't have Twitter, you can still follow along at this link. The Ghost's profile image to the left, created by @AmberJCarter on Twitter. The Book Pushers have posted an interview with me that those of you who are fans of Kit will enjoy, as we discuss his future. 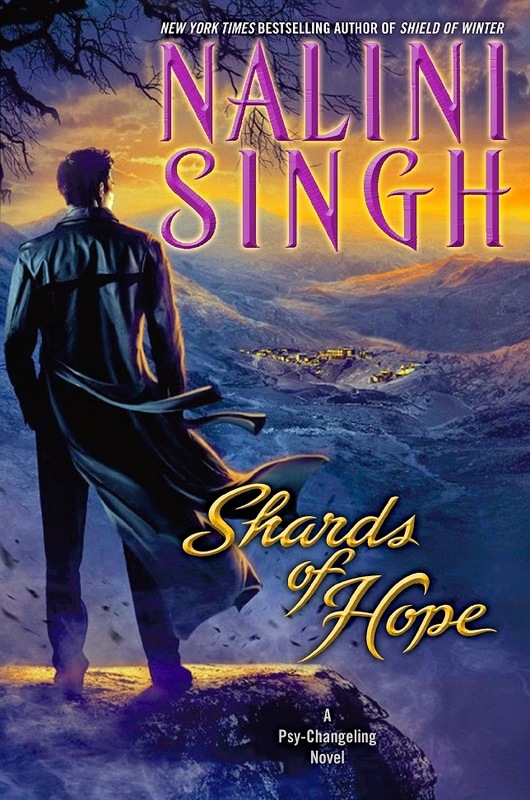 I have an interview up at Fiction Vixen where I discuss what makes a hero heroic, so swing by and add your comments. And last but not least, folks are doing some fun things for their Heart of Obsidian Mega Contest entries. Here's a link to a great video by Harriet, where she discusses the Psy-Changeling series, as well as the other things she loves. This contest is for everyone who loves the Psy-Changeling series! The aim of the contest to is spread the word about Heart of Obsidian, and give back to fans at the same time. That's why we have so many prizes, so lots of people can win! I know it's a long post, but please read to the end so you can discover all the cool prizes and the correct way to enter. We've tried to be as clear as possible, but if you have any questions, please leave a comment or email my assistant, Ashwini. Her email is listed below. Contest will run from 10pm May 22nd, 2013 to midnight June 16th, 2013 (New Zealand time). Winners to be picked through a random draw and announced Saturday July 6th. You can enter two times, but you have to fulfill the requirements for entry each time. (ie. You have to do two unique things to enter). Why only twice? Because we want to keep this fun, fair, and not spam anyone! 1) Do something to help spread the word about Heart of Obsidian within the period of the contest. As you can see from the ideas we mention below, you should all be able to enter. 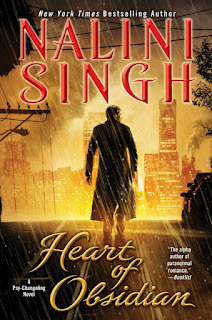 - Do an online review of Heart of Obsidian after it releases (can be on your own blog, on Goodreads, or on Amazon or Barnes & Noble etc). The contents of the review are of course, totally up to you. You'll have plenty of time to enter as the contest runs till June 16th. - If you have a blog, a website, or a Tumblr etc, you can write a post about your favorite book(s) or character(s) in the series, or maybe about which characters you'd like to see books for...the topic is open. Just mention Heart of Obsidian as a new release, or use one of the graphics below in your post. If you'd like to do a giveaway in conjunction with your post, we'll happily provide you with a paperback backlist book and we'll post it out to the winner (see full details below). - Create a quiz about the series or your favorite book/characters and include a question about Heart of Obsidian. You could use the two chapter preview available to create that question. - Create original artwork based on the books and share it online, linking through to the Heart of Obsidian page on the blog or on the website. -Set up and fill a Pinterest board for Heart of Obsidian or the series. 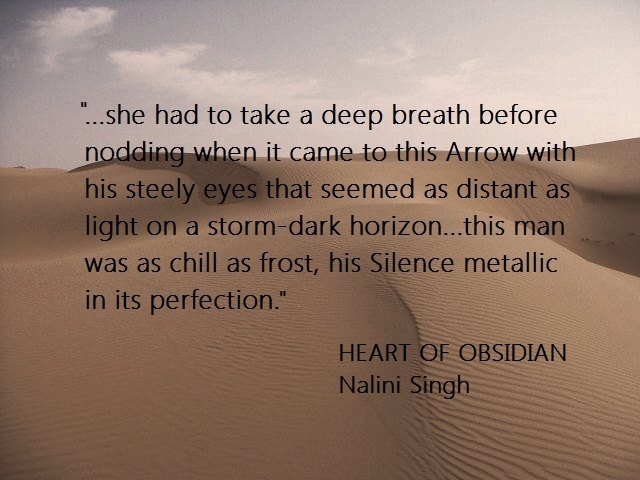 - Put up a small banner for Heart of Obsidian on your blog/page etc for at least one week. We'll provide the graphics - you can see them in this post, so feel free to use these. Link it back to either the Heart of Obsidian page on the blog, or the on the website. If you'd like to use the gif banner above, you can just save it off the blog to use, or if you'd like the html code, email and we'll send it to you. Please link it back to the excerpt. - Create your own banner about Heart of Obsidian or the series and share it (just make sure you have the right to use any images you pick). - Change your Facebook cover photo to the one on Nalini's Facebook page for at least a week. The file is pasted below, or you can email us and we'll send it to you. - Do a YouTube video related to the series. A review, a discussion if there are two of you, anything fun. We're up for seeing some interpretative dance ;-) Just mention the release of Heart of Obsidian in the video. 2) Once you have done something to spread the word, email Ashwini with details of your entry, your address (so we can quickly post out the prize if you win), using the correct subject line (please see below). There are some German language books up as prizes, so we need to know if it's okay to send you a German language book if you win a book prize. 3) In your entry, please put down which five prizes or types of prizes you'd most like to win. Since lots of people will want the same prizes and the drawing is random, we can't guarantee you'll get one of your choices if you win. However, as there are different ARCs for example, if you'd like one by a particular author, please put it down. Then, if you win an ARC, we can try to accommodate your choice. If you don't have any preference, put that down instead. 4) If you'd like to enter a second time, follow steps 1, 2, and 3. 1. (a) If you do a blog post, quiz etc, and would like to do a giveaway for your followers/readers, then we'll provide a copy (paperback) of a book for you to give away (as long as stocks last). We've set aside a good number of books for this, so the chance is very high that you'll be able to get one for your giveaway. We have books in English and German for you to give away, so let us know which language you'd like. 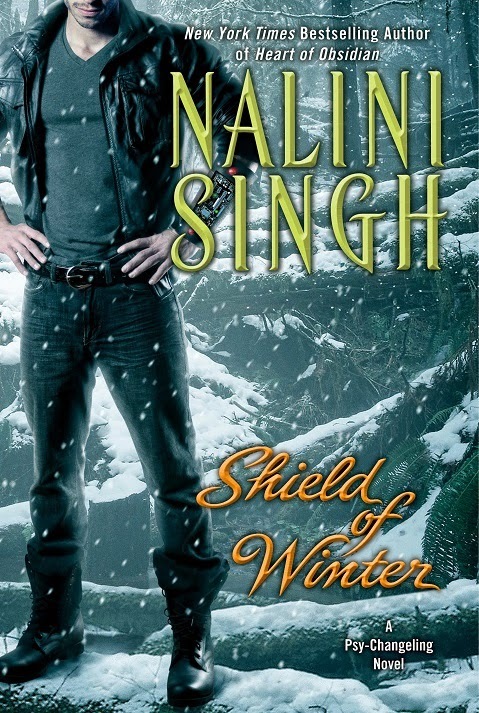 Email Ashwini if you would like to do a giveaway: (naliniDOTassistantATgmailDOTcom). (b) We will also cover the cost of mailing out the above giveaway books directly to the winners, wherever they are in the world. 2. 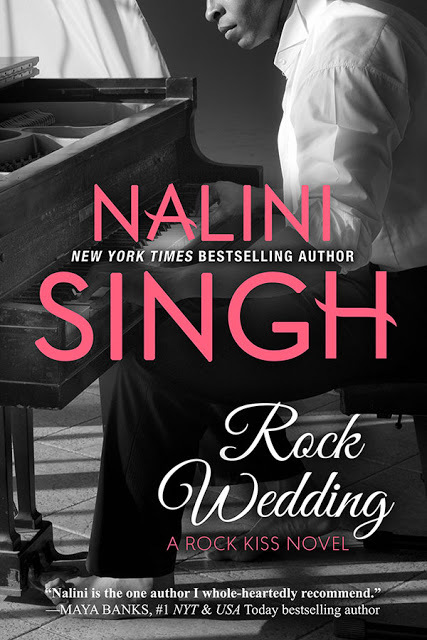 Because this is all about sharing the love, we'll link to your quiz, artwork, giveaways etc from the blog, Nalini's Facebook, Twitter or Tumblr (one link for certain, likely a couple), so long as you send us the link in time. 3. We've provided graphics you can use, so you can enter by choosing to use one of these. 4. We'll provide some super cool prizes for the prize drawing when the contest closes!! 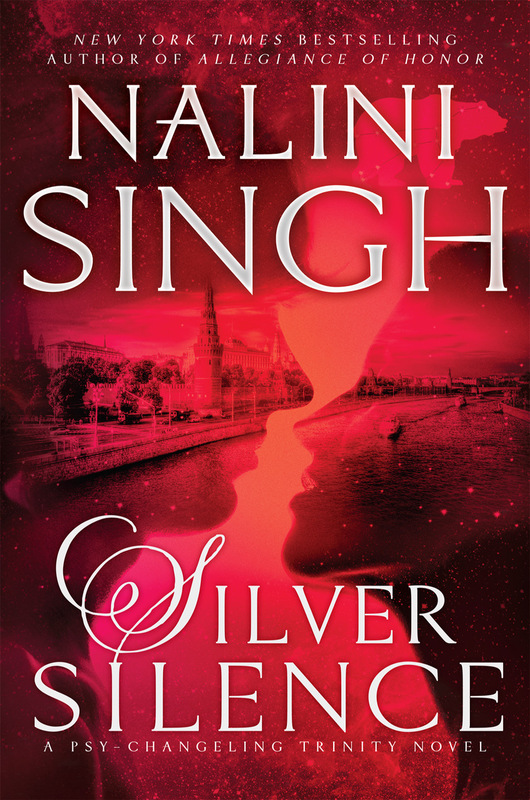 And if you win one of Nalini's books, Nalini will happily sign the book personally to you. 1. A promise of an advanced copy of PSY-CHANGELING #13 (this will likely be ready sometime in March 2014, so you'll have to be patient, but you'll get it as soon as a bound galley is ready to ship. If, for some reason, there are no bound galleys, I'll print out and send you a signed copy of the galley proof). 2. A promise of an advanced copy of ARCHANGEL'S LEGION (this will likely be ready around August/September 2013 and should be a bound galley. If there are no bound galleys, I'll print out and send you a signed copy of the galley proof). 3. The Food Prize: A HEART OF OBSIDIAN mug, chocolate cookies and candy from New Zealand. (Yes, there will be Tim Tams). We won't buy the cookies and candy till it's time to ship, so if you have a special request, we'll do our best to hunt down the goodies. 4. A 30 minute one-to-one Skype chat with Nalini (though if you want to invite a friend or two, that's absolutely okay). We'll work out which time works best for you and set it up. 5. A poster of the US cover for HEART OF OBSIDIAN. (FYI: These will also be given away at my tour stops, and are limited edition, with only a few printed). 6. Advanced copies of books by other authors (one winner for each ARC). These are the ARCs we have (some may be bound galleys, others finished copies) - huge thanks to my editor, Cindy! 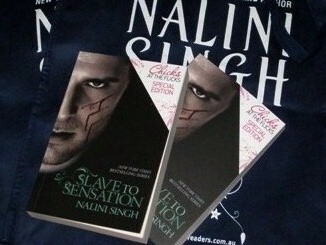 (a) A special limited edition signed copy of Slave to Sensation printed for a recent "Chicks at the Flicks" promotion in New Zealand. There were only a few thousand of these printed, so they'll soon become very difficult to find. 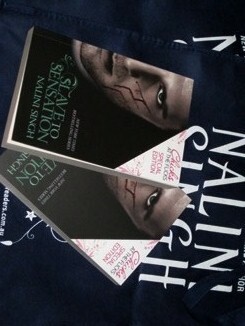 The book will come in a dark blue Nalini Singh tote bag (originally printed for the ARRA Convention). See the photo to the right. Two copies available, so two winners will be chosen for this prize. (b) A full signed set of the Guild Hunter series to date (Angels' Blood, Archangel's Kiss, Archangel's Consort, Archangel's Blade, Archangel's Storm, Angels' Flight). (d) A signed copy of the UK Tangle of Need hardcover that has the incorrect backcover blurb. These were reprinted with the correct blurb very quickly, but a few with the incorrect blurb leaked out into the world. Fun if you like collectors editions. 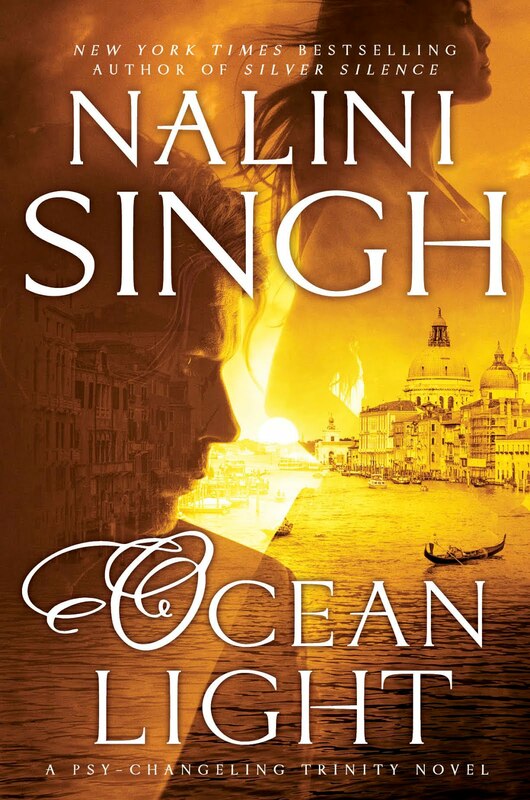 (e) A signed copy of the winner's choice of a paperback backlist book (that means books published up to the end of 2012) from Nalini, so long as we have a copy available, each with a Heart of Obsidian bookmark. Ten winners will be chosen for this prize. Entries open 10pm May 22nd 2013 (New Zealand time) and must be submitted no later than midnight June 16th, 2013 New Zealand time. Two entries per individual, as per requirements above. No purchase necessary to enter. The legality of each individual entry, including the text written and any images used, are the responsibility of the entrant. Barring any delays caused by unforeseen circumstances, winner(s) will be chosen randomly and contacted via email on July 6th, 2013. Each winner can win a maximum of two prizes. In the case that there aren't enough entries for all the prizes, the remaining prizes will be held over for a future contest. By entering the contest, you give us the right to announce your name on the blog (we're happy to use a nickname or online handle if you prefer). Void where prohibited. 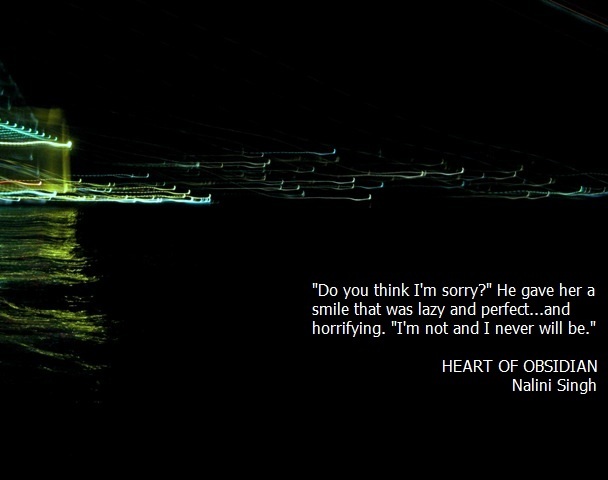 As promised, you're about to read the first two chapters of Heart of Obsidian. But, before you do, I have some other info for you, so have a quick read before you jump to the excerpt. (Edited with updated links). ♥ This excerpt consists of Chapter 1 and Chapter 2, so you can read it without spoiling later sections of the book. If you're viewing this on Goodreads or on another feed, some of the formatting may be lost - please click through to the main blog to read. ♥ If you're here looking for my USA/London book tour info, follow this link. ♥ For those of you on Twitter, there will be a fun chat happening Thursday. 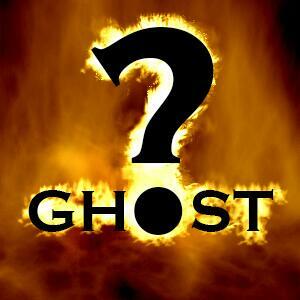 The Ghost is hijacking my Twitter profile from 9-10pm EDT, Thursday 23rd May for a Q&A. The hashtag is #penguinromance. If you're not on Twitter, don't worry. I'll post a link where you can follow along. ♥ Jane at Dear Author has reread the entire series and done a post all about the Arrow Squad, so make sure to swing by and read! ♥ The Heart of Obsidian Mega Contest is now open! 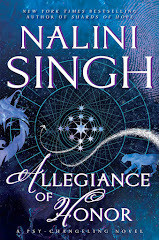 ♥ The COMMENTS thread of this blog post will function as the Spoiler Zone for Heart of Obsidian. It should be safe enough now if you want to join in the discussion about the excerpt, but once the book releases, it will become much more spoilery. As always, have fun in the comments, and please be respectful of one another's opinions. ♥ And one final tidbit: You'll see one particular mystery remains unanswered in this excerpt. The answer comes just a few pages later in the book, so resist the urge to peek ahead when you get it! Excerpt begins below the banner. Click away if you don't want to read it! Kaleb Krychek, cardinal telekinetic and a man no one wanted to meet alone on a dark night, had been searching for his quarry for seven years, three weeks, and two days. Even while he slept, his mind had continued to hunt through the sprawling psychic network that was the heartbeat and the cage of the Psy race. Not for a day, not for a second, had he forgotten his search, forgotten what they’d taken from him. Everyone involved would pay. He’d make certain of it. Her response was to crush herself impossibly further into the corner and tighten her arms around the knees she hugged to her chest. She’d spent the hour since he’d retrieved her from her prison rocking to and fro in brittle silence. Her hair was a tangled rats’ nest around her face, her upper arms bearing both fresh scratches and marks of older gouges. She was still a bare five feet, two inches . . . or so he judged. She’d been in a huddled position pre-teleport, had only curled further into her shell in the past sixty minutes. Her eyes—a blue so deep they were midnight—refused to meet his, skittering away if he entered her line of sight. Now she ducked her head, the matted waist-length strands that should’ve been a rich black interwoven with unexpected strands of red-gold, dull and greasy around her down-bent face. That face was all bone under pallid skin of palest brown, the nails on her hands gnawed to the quick yet embedded with dried blood that said she’d used the stubs to viciously scratch either her own skin or another’s, perhaps both. At last, he understood why the NetMind and DarkMind, the twin entities that knew every corner of the vast psychic network that connected all Psy on the planet but for the renegades, had been unable to find her—regardless of how many times he’d made the request or how much information he’d given them in an effort to narrow the scope of the search. Kaleb had been inside her mind during retrieval, had needed to be to complete the teleport, and even then, he wouldn’t have known it was her if he hadn’t had incontrovertible evidence to the contrary. The person she’d been was gone. Whether what remained was anything more than a broken shell was yet an unanswered question. He used words that would’ve once caused her to react—but he didn’t know if that part of her existed any longer. The file he’d so meticulously put together over the years, the file he’d studied until he could recite the contents in his sleep, was going to be useless. She was no longer that girl with her hair brushed straight and shiny and midnight eyes that seemed to see far beyond the skin. Logic said he needed to get a Psy-Med specialist in here as fast as possible. But Kaleb knew he wasn’t going to do that. He trusted very, very few people and he trusted no one when it came to her. Since his current approach wasn’t bearing the results he wanted, he shifted focus with the ease of a man who had no emotional attachment to a decision. “Your lips are cracked and it’s clear you haven’t had enough fluids for at least twenty-four hours.” In the split second that he’d teleported into the white-on-white room where she’d been held, the overhead light cutting in its torturous brightness, he’d seen the bottles thrown at the wall, the liquid soaked into the floor. His initial assumption had been that the painful brightness was a normal part of her existence, but it may have been a punishment, her captors attempting to break her will. That it wasn’t already broken. . . yes, it said something about the woman who refused to interact with him on any level. She hissed at him, dark blue orbs glinting behind the tangled mass of her hair. Still she resisted. Unexpected. Her mind might be broken, but it wasn’t—had never been—unintelligent. No, her intellect was so piercing, her teachers had struggled to keep up with her. She had to be aware that refusing him wasn’t an option. The power of a cardinal telekinetic was vast. He could crack every bone in her body with a fleeting thought, crush those bones into dust if he so chose. Even if she no longer understood that, she’d experienced his strength when he teleported her from her cell and to his home; she had to comprehend her precarious situation. Her eyes flicked to the glass in his hand, teeth biting down on her badly cracked lower lip. Yet she didn’t reach for the water she so patently needed. Why? He took a moment to think, consider the circumstances in which he’d found her. “It’s not drugged,” he said, talking to a face that held no recognition, no sign that she remembered their final blood-soaked encounter, an encounter where she’d screamed for so long and in such agony she’d caused damage to her throat that would’ve needed medical attention to repair. “Infused with the minerals and vitamins that you need,” he continued, “but not drugged. You’re no use to me in a coma.” Holding her gaze when it finally connected with his, he took a healthy swallow of the water, then held out the glass. She stared up at him, eyes narrowed. “Fine, I’ll make the decision for you.” He brought in a plate of fresh, uncut fruit, as well as a thick slice of bread spread with butter and honey. It wasn’t the kind of food he ate—like most Psy, he lived on nutrition bars, for Silence thrived in the absence of sensation, and taste was a powerful one. His guest’s Silence, however, had been shattered a lifetime ago. Sensation might well be the key to bringing her back from the mental wasteland where she’d retreated, her personality and abilities entombed. Teleporting in a knife, he sliced the bread into four smaller pieces, then, going down on his haunches, held the plate out to her. She stared for over a minute before selecting a piece not in the quick jab he’d expected, but with measured deliberation. So, her captors hadn’t starved her. She’d chosen not to eat. It took no effort to reach out with his mind, set the water to boil in the kitchen, prepare a mug of tea just hot enough that she could sip it. He dumped three teaspoons of sugar in the mug before bringing it in for her. This time, she didn’t hesitate, cuddling the mug to her chest. Realizing she was cold, he adjusted the thermostat to further warm up the already warm room. She didn’t react except to take another quarter of the bread. As she ate with slow neatness, he had the sense he was being evaluated. It would’ve been easy to jump to the conclusion that she wasn’t as broken as she appeared, that this was all a clever act, but the fleeting moments he’d spent in her mind told a far different story. She’d been splintered from the inside out. The intelligence that judged him at this instant was more akin to the primal hindbrain that existed within every civilized being, the part that knew how to identify predator from prey, danger from safety. It wasn’t the level of function he needed from her, but it was better than total catatonia or actual physical brain damage. Her brain was fine. It was her mind that was broken. Picking up an apple, he went to cut it, but her eyes flicked left to the grapes. He didn’t say a word, simply put down the apple and turned the plate so the grapes were close to her hand. She ate four, took a sip of tea, and stopped. Half a slice of bread, four grapes, two glasses of water, and a sip of tea. It was a better result than he might have initially predicted. The subtle rocking that had restarted when he rose to his feet stopped, and he knew she was listening. He had read Psy-Med Journals in preparation for the eventuality that she was broken when he found her, had even sat in remotely on countless lectures on the subject, but where the specialists recommended quiet, calm, gentle interaction, he knew the primitive mind behind those eyes of midnight blue would see right through such an act. He was the monster that stalked nightmare, and they both knew it. “You can move around the house as you please,” he told her, calculating how many years it had been since she’d been allowed any kind of freedom. The entire span of her captivity? If so, in this he could understand the impact on her psyche better than any stranger with psycho-medical training. Her shoulders stiffened. Perhaps, he thought, there was more than an animal mind present within the fragile shell of her body. Perhaps. “If you prefer another room, choose it. For now, the bathroom is through there.” He pointed to the door on the other side of the bed, having deliberately chosen the smallest suite in the house for the same reason he’d given for the lack of windows. He’d built the suite for her, for this exact possibility. It was impossible to predict how she might react to the wide-open vista that encircled the house. He had no neighbors within screaming distance . . . further. The one side not bounded by grassy fields housed the terrace—and it was flush up against a jagged gorge. A terrace, he realized all at once, that had no railings, and could be reached by any number of rooms in the house, including the bedroom across from this one. The rocking had stopped totally by now. “There are civilian clothes for you in the closet.” Not every piece would fit her emaciated frame, but she’d have enough for the time being. “If you’re attached to your institutional uniform”—a white smock, white pants, both filthy—“there’s a clean set in the dresser.” He’d sourced it a few minutes ago from a medical facility that would never notice the lack. The woman in the corner remained mutinously silent. Turning, he walked to the door, his fingers playing over the tiny platinum star in his pocket. “It’s after midnight. Sleep if you wish—if not, the house is yours to explore. I’ll be on the terrace.” He left without further words. This chess game was the most important of his life, each move as critical as the next. Those who’d held her captive had treated her as one might a dumb animal, but she was not that. No, she was far more gifted a prize. One he would do nothing to jeopardize. As he would make no final decisions. Not yet. Not until he knew how much of her they’d broken. Kaleb could’ve built the barrier between the terrace and the gorge using his telekinetic abilities, but he stripped, changed into thin black sweatpants designed to keep the body cool and took on the task manually. As a Tk, energy was his lifeblood, but right now, he had an excess of it—not on the psychic plane, but on the physical. Had he been human or changeling, the sudden spike in his energy levels might’ve been put down to excitement in achieving the goal that had been his driving force for seven years, in having her in his home and within reach. But he wasn’t a member of the emotional races. He was Psy and he was Silent, his emotions conditioned out of him when he’d been a child. His path to that Silence had been erratic at times, but the end result was the development of a coolly rational mind that held no shadow of fear or hope, anguish or excitement. He had once had a large structural flaw in his conditioning, a bone-deep fracture in his Silence, but that had been in another life. The fracture had sealed to adamantine hardness, the weak spot morphing into the strongest part of his Silence, but he knew that behind the stone, the fault remained. The day it no longer did . . . it was better for the world if that didn’t come to pass. Wiping the sweat off his brow with his forearm, he turned up the voltage on the outdoor lights and began to drill in the screws that would ensure the metal barrier he was putting in place wouldn’t collapse even in a major earth tremor. He hadn’t searched so long for his quarry to lose her through a lack of preparation. Even as he concentrated on the task, he kept an ear open for his guest. Some would say “prisoner” was the more apt term, but the words didn’t matter. Only the fact that she was in his grasp. Drill abandoned, he’d teleported into her room before he consciously processed the violence of sound. The dresser mirror against the wall opposite the bathroom door lay smashed, shards of glass on the carpet, on the bed, on her as she sat hunched in the center of that bed. A smeared streak of wet red sliced her cheek from where a splinter had flown directly at her, but she appeared otherwise uninjured. Not far from the mirror lay the broken pieces of the mug she’d used to shatter the glass, the spilled tea a rusty stain on the dresser itself and on the pale rug that covered the polished wood of the floor. Kaleb didn’t ask for the reason behind her behavior. “Stay still.” Gathering up the larger fragments of glass, he teleported them out into the waste receptacle. He knew a teleporter who could take blood itself out of carpet, but Kaleb’s ability worked on a larger scale. He could cause an earthquake that would devour a city, rip an airjet out of the sky with his mind, even create a tidal wave—what he could not do was pick up every tiny sliver of glass. His guest let out a surprised gasp, grabbing at the sheets as the entire bed lifted a foot off the floor. Holding it and the other furniture aloft, Kaleb used his Tk to roll up the thick rug that ran the entire length of the room and covered ninety percent of the floor. There appeared to be no shards on the floor itself, but he walked around the room to make certain before returning to his position by the door, the rolled-up rug at his feet. Gauging the impact of the stains caused by the tea, he accessed a visual file he made certain to keep up-to-date and, using the image as a lock, teleported the rug straight into the incinerator of the region’s central waste processing and recycling plant. Neither his DNA nor hers could be permitted to fall into the wrong hands. The woman on the bed stared at him, before doing something he hadn’t anticipated. She picked up the small vase on the bedside table and threw it at something above his head. He ducked, turning just in time to stop the projectile from impacting with the tiny sensor light that gave away the position of the fire alarm. As the vase hovered in front of the blinking red light, he began to comprehend the very rational reason behind her apparently irrational act. “It’s not a camera. And the mirror was just a mirror.” Even as he spoke, he understood that she wasn’t going to believe him. The alarm would be in pieces the instant he walked out the door, even if she had to use every projectile in the room to smash it. Her gaze went to the recessed ceiling light. No change in her focus. She took her time doing so, but when she turned it on rather than attempt to destroy it, he judged her satisfied that it wasn’t rigged with surveillance equipment. Dismantling the ceiling light, he scanned the room for anything else that might read as suspicious to her mind. Nothing stood out, and, given the areas on which she’d focused, it was likely she’d already checked the walls and visually examined the ceiling. Categorically not a mind functioning on the animal level alone, regardless of what he’d seen of her twisted mental pathways. Walking into the bathroom on that thought, he removed both the light and a ceiling-mounted heat lamp, replacing them with a tall, freestanding waterproof lamp she could take apart if necessary. The mirror went, too, and he removed the fine grille on the airflow system so she could see there was nothing beyond but a silent fan meant to mitigate condensation. By the time he returned to the terrace, his skin had cooled, but it heated up quickly enough, even in the light breeze coming off the trees on the other side of the gorge. With each screw he drilled into place, he considered the room where she’d been held, the probable response of her captors when they’d lost the feed from her cell to sudden static. It would’ve lasted mere seconds, left them staring at the image of an empty room after it cleared. The static was a useful tool he’d discovered as a teen while experimenting with his abilities. The sheer strength of his telekinesis meant he put out a low-level “hum” that wasn’t discernible to humanoid ears, but that made animals uneasy and messed with technology. He had it under control now, of course. The only time he permitted the hum to escape his shields was when he needed to obfuscate his presence in front of a camera or to otherwise disrupt technological surveillance. It was an aspect of his abilities known to only one other living individual aside from Kaleb. Nevertheless, given the speed of the teleport, his guest’s captors would suspect the involvement of a high-level Tk, and there were very few of them in the pool, but no one would know it had been Kaleb. Not until he was ready. And then they would beg for mercy. Even the most powerful, most Silent begged in the end, the conditioning cracking in the face of a scrabbling panic that blinded them to the fact Kaleb had no mercy in him. The final screw in place, he packed up his equipment and teleported it away. It was odd to see the terrace surrounded by metal railings—they allowed a view out from between the bars, but no entry to the black maw of the gorge. Not even his guest was thin enough to fit in the spaces between the bars. The polite telepathic knock belonged to Silver, his aide and a member of the quietly influential Mercant family. He opened the telepathic channel. What is it? He didn’t remind her that he’d asked not to be disturbed—Silver wouldn’t be going against his express orders unless it was necessary. There’s been an attack against a small think tank in Khartoum. The think tank had just announced the parameters of its next research project: the benefits to Psy of greater political cooperation and social interaction with humans and changelings. So, he thought, the next volley had been shot in the civil war that loomed over the PsyNet. How many dead? All ten of those in the building at the time. A poisonous gas introduced into their air supply. Has Pure Psy claimed responsibility? The radical pro-Silence group had gone quiet in the aftermath of its decisive defeat in the California region at the hands of a force comprised of the SnowDancer wolves and the DarkRiver leopards, as well as Psy who looked to the two Councilors in the area—Nikita Duncan and Anthony Kyriakus—for guidance. The humans, too, had joined in the resistance to Pure Psy’s attempt to seize control of the greater San Francisco and Sierra Nevada region, leading to an alliance that crossed racial boundaries Pure Psy wanted to maintain at all costs. Such a motive seemed to run counter to the group’s avowed focus on the PsyNet, but underlying Pure Psy’s outwardly “rational” rhetoric was the belief that the Psy were superior to the other races, that if their people would only seal the cracks that had begun to appear in the foundations of the Silence Protocol, they would once again be the most powerful race on the planet. Any attempt to better integrate the Psy populace with the humans and changelings was thus seen not only as an attack against the Protocol, but as a threat to the genetic superiority of the Psy race. It was an unsound premise. Kaleb knew the Psy were as flawed as the humans or changelings—he’d come of age in rooms ripe with the scent of congealing blood, screams echoing in his ears; he knew the dark underbelly of their race had simply been buried, not erased. Confirmed, Silver said after a short delay. Pure Psy has taken responsibility for the poisoning, and the claim was public. She sent him a visual, her telepathy strong enough that it was crisp, clear. The side of the building owned by the think tank had been emblazoned with the image of a star with the letter P at the center. The P was white, the area around it black. Below were the words Absolution in Purity, JOIN US. This is new, he said to Silver. Yes. It’s the first appearance of this decal. A decal. That explained how the Pure Psy operatives had been able to put it up so fast. He wondered if the religious undertone was intentional. Vasquez, the faceless man at the head of Pure Psy since Councilor Henry Scott’s demise, might be a fanatic, but he was a smart fanatic, as evidenced by the fact that no one had been able to dig up any verifiable details about his physical appearance. Now, even as he decried those whose Silence was fractured, who believed emotion was not the enemy of the Psy race, he used an emotive call to arms. Why hasn’t this news hit the Net? Kaleb might have been distracted over the past few hours, but his mind continued to scan the pathways of the Net, and he’d heard nothing of what was a significant act of aggression. Bad timing, answered Silver’s mental voice. Pure Psy operatives must’ve finished putting up the decal seconds before an Enforcement vehicle cruised down the street and spotted it. The officers became suspicious, checked the building, and discovered the bodies. As a result, the external processing is being completed while the city sleeps, the decal removed. The only reason I have the data is because of a cousin high in Enforcement Command in the country—they’ve managed to black out the incident as far as the media are concerned. The failure to gain Netwide exposure would only incite Pure Psy to further acts of lethal violence. Is your contact any closer to infiltrating the inner circle? While Pure Psy was doing an excellent job of creating the instability he needed for his current endgame, the group was a rogue element. Kaleb preferred iron control in all things. No. Vasquez is very, very careful. Continue to monitor the situation in Khartoum. Keep me updated. Hearing a tiny sound at his back as he closed the telepathic link, he walked to the railing instead of turning, his eyes on the impenetrable depths of the gorge. The lights went off a second later, leaving the terrace lit only by the stars, the moon at full dark tonight. Bare feet padding on the wood of the terrace, a whisper of scent, clean and fresh, a flutter of green as she came to stand beside him—though she left a good three meters of distance between them. Dressed in a green T-shirt and soft gray pajama pants, she’d clearly washed her hair, but it hung tangled and knotted around her face, hiding her profile from him as she closed her fingers around the bars, squeezing the cold of the metal so hard her skin turned ghostly white. If you know the spoiler, shhh until Monday. After that, you'll have a spoiler zone to discuss everything freely. We just didn't want to risk posting an excerpt without warning the folks who want to avoid all spoilers. Also, because of the excerpt release, the big contest I mentioned in the last newsletter will launch Wednesday now. Prizes include ARCs for a number of books, not only my own, as well as other goodies! p.s. Don't worry if you do want to continue to avoid spoilers - I'll plaster it with warnings so you can't accidentally see it!! *Monday USA time. For those in my timezone, it'll be late Monday night/early Tuesday morning. To be interviewed onstage by Jane Litte of Dear Author! Anderson’s offers “priority numbers” to readers in order to be at the front of Nalini’s signing line. 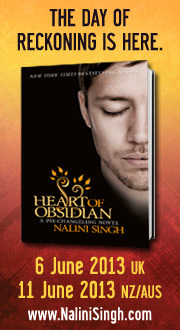 You can receive a priority number by pre-ordering your copy of HEART OF OBSIDIAN at Anderson’s now! You can, of course, pick the book up from Anderson’s on the release date. You may also buy the book on the release date, June 4th, and ask to receive a priority number. In either case, you will need to bring your number and book with you to the event on June 10th. You may also purchase the book online through Anderson’s website, www.andersonsbookshop.com, but you will need to indicate in the message box that you are attending the event and would like a priority number. Anderson’s will then respond via email with the number. 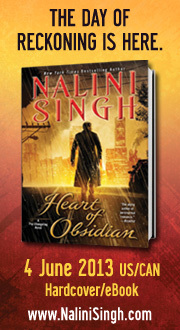 Follow link for details on how to order an autographed copy of Heart of Obsidian! Warning: If you're planning to go into HEART OF OBSIDIAN without reading any snippets etc, look away, look away!! Everyone else, scroll down. "Yes." The confession felt as intimate as what he'd just done to her body. "With you." His expression altered to a hardness that made it clear who and what he was, his arms coming down on either side of her as he lowered his face until their breaths kissed. "It will," he said in a silken whisper, "only ever be with me." Edited to add: Inbox cleared. If you've emailed me and not received a response, it's likely it never arrived. So go ahead and resend. (Also, I feel like a keyboard ninja right now *grin*). I'm doing a marathon email session this weekend to clear my Inbox. In the process, I'm rescuing some very old emails out of spam folders and the like, so don't be shocked if you suddenly get a reply to something you sent ages ago! Another week has raced by, and it's time to talk books again! What are you reading and loving this week? The May newsletter is almost ready to go. If you aren't already a member of the mailing list, join up and click the confirm link in your email before 9am EST Tuesday to get this one. Signup form on the right sidebar of the blog and on the top right of the front page of the website. Warning: If you're planning to go into HEART OF OBSIDIAN without reading any snippets etc, look away, look away!! Her fingers curled into her hands as she watched him, the fluidity and grace of his body doing nothing to mask the fact that the beautiful movements could quickly turn lethal. It was hypnotic, the way he moved, the flex and release of his muscles compelling on a visceral level, until she found herself leaning against the French doors, her palms spread on the glass. Today, I'm catching up on this and that. What are you up to? Shaking her head in a mute refusal to accept what he was trying to tell her, she whispered, "What have you done?" "Too much that can never be undone."